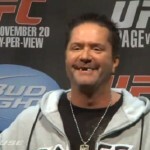 UFC 155 just wasn’t the same without the great Mike Goldberg commentating alongside Joe Rogan this weekend. Apparently he had to take sometime off and rest at home due to an illness.The UFC is not sure when Mike Goldberg will return so Jon Anik will be filling in for him for the foreseeable future. Hopefully it’s nothing too serious and Mike Goldberg can return as quick as possible. So, in spirit of Mike Goldberg, I’ll post some funny Mike Goldberg quotes that have been floating around the internet for years now.